The hotel will feature a new fitness and health centre, and a Presidential Suite with panoramic views. The Regency Bar and Jardin des Cygnes restaurant will undergo a metamorphosis, while the Patio will reclaim its past to become centre stage.Built in 1928 in art-deco style, this timelessly elegant hotel is moments away from the Champs-Elysées. Known for its traditional approach to hospitality and exceptional level of service, it has welcomed many VIPs and celebrities over the years. 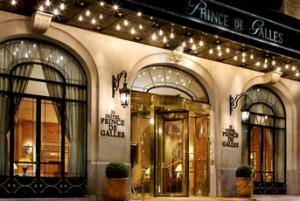 ith its prime location in the heart of Paris, the Prince de Galles is the ideal place for your next meeting or special event. Our meeting rooms can accommodate up to 200 attendees for every type of event—from high-level meetings to private events.A highly personalized level of attention will ensure that every moment is a great success. Our catering team is trained to provide support throughout your event and will ensure that your practical and technical needs are met.